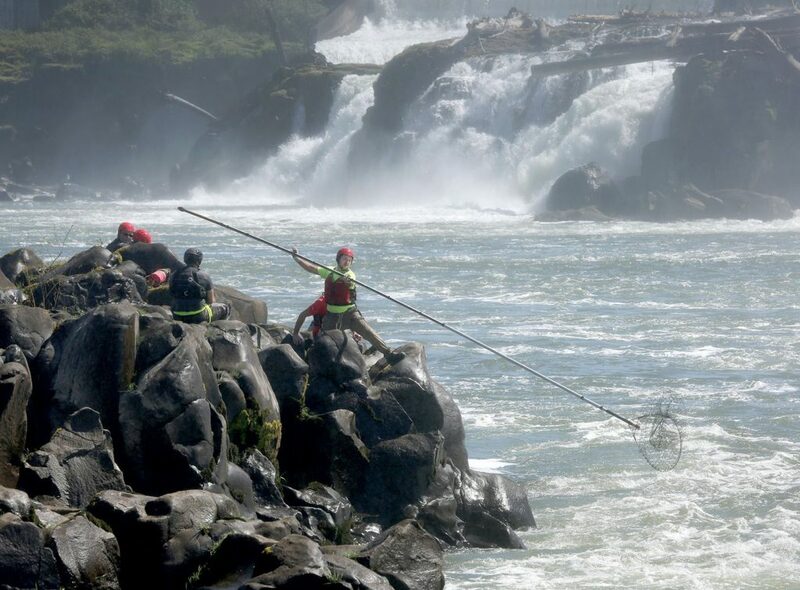 Those of you who have read my new book on Peter Burnett will have noticed references to Native American fishing at Willamette Falls, near Oregon City. The forty-foot high falls was a traditional tribal fishing ground for salmon for many centuries for the Chinookan peoples and others until the arrival of a white population and industrial development pushed them away. Well, great to say, some fishing with traditional dip nets has been restored for the first time in a century. The first salmon was netted on May 16 and was ceremonially cooked and eaten by tribal members near the falls. “It is an opportunity to experience something that hasn’t happened in a long time,’’ said Jordan Mercier, a member of the Clackamas Tribe, which once occupied the area around the falls. The tribes surrendered their fishing rights in the 1980s in exchange for land for a reservation in western Oregon that brought together remaining members of the Umpqua, Molalla, Rogue River, Clackamas, Kalapuya and Chasta tribes, now together known as the Grand Ronde Tribe, or the Confederated Tribes of the Grand Ronde. The tribe operates the popular Spirit Mountain Casino in Polk County. The tradeoff of fishing rights for a reservation was painful, said Cheryl A. Kennedy, chairwoman of the Grand Ronde Tribal Council. Recalling the debate at the time, she said, “There were four women and five men on our council and we said, ‘We can’t give up our rights; but the men were more pragmatic and told us we wouldn’t have anything at all if we didn’t get a reservation, so we signed the consent decree to give up our rights forever.’’ She was quoted in the June 1 issue of the tribal newspaper, Smoke Signals. But public opinion and gradually changing attitudes have worked in the tribe’s favor in recent years, albeit to a limited degree. The Oregon Fish & Wildlife Commission restored limited rights to the tribe, allowing for the harvest of spring Chinook salmon for ceremonial purposes with a limit of 15 per year.